Summary: Personal and shared event calendars. Description: Manage group and shared calendars with download. Latest Bug Fixed: 2018-03-20 Calendar fails automated test: Test case acs_tcl__tcl_file_syntax_errors. Sync contacts with contact managers, palm pda's etc. Note I see a small potential issue. Within one calendar it makes sense to color code by calendar types. When using dotLRN or otherwise aggregating calendars it makes sense to color code by calendar_id (source). It probably never makes sense to do it both ways on the same site. We may need to think this through. Maintained by Dirk Gomez - last change on 22-Jan-2004. I am tracking my work on calendar here. Please get in touch with me if you have comments. Proper use of OpenACS permissioning. The calendar view templates take a lot of parameters some of which require knowledge of the inner workings of the respective template: e. g. currently the calling templates passes in a url_template which determines whether an action on a particular item can be executed. I'll move this to being proper and understandable parameters like create_p or edit_p. New parameter Collaborative Calendar: a parameter that allows every user of a community to add, edit, and delete events if set to true. New parameter in DotLrn: parametrize whether to show calendar lists for a whole term. Allow users to store calendar preferences for example the user default view. The calendar_preferences table already exists, yet isn't used at all. Add a toggle: "Show all my events/Only this package's or community's events"
Use a site-wide categories package to do away with the calendar types and the multiple calendars per package. if there is a conflict among registered users' schedules, the systems suggests possible times to the inviter. people external to the system can be invited. Book an item: suggest alternate times across multiple calendars if asset is unavailble. Example: 5 Smart Cars for rent each have their own calendar; if all are booked from 10 - 11 AM, suggest 9-10 or 11-12 across all calendars. Calendar items should map arbitrary objects (perhaps only content items) to a given calendar and given acs-events. We shouldn't have to derive special types from cal item type in order to attach it to a calendar (nor should we have to duplicate content to attach it to two calendars as we do now) If we restricted the mapping to content items (i.e. calendar info some sort of content type) we could use the CR's ability to map a template to a given content type or item to make it possible for the calendar package to display calendar item details using that facility, giving the package adding something to the calendar control over how it is displayed. Much more general. From above: "Use a site-wide categories package to do away with the calendar types and the multiple calendars per package." I'm listing stuff here on which I am already working, but whose completion is nowhere near finished and there is not even an estimation when it may be finished. 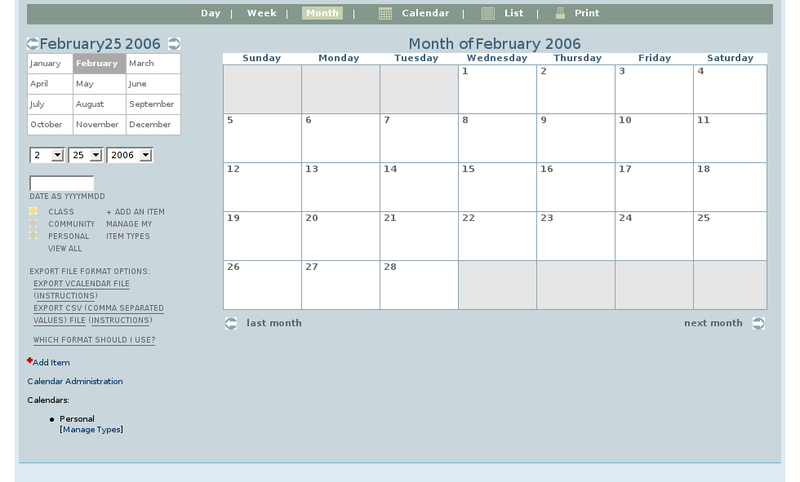 June 12, 2006 - Solution Grove worked on an AJAX calendar month view that has colors by calendar_types, has mouse overs for item details for each date, and changes months without refreshing the pages. They hope to contribute it at some point. Contact Caroline or Hamilton from Solution Grove if you need an advanced copy.